Throughout history, Korea has been attacked and occupied by numerous nations. The land was under Mongolian occupation from the early 13th to the mid-14th century. In the 19th century, Korea was caught in the middle of rivalries among China, France, Great Britain, Japan, Russia and the United States. Japan annexed the peninsula in 1910 and controlled it until the end of World War II, when it was divided at the 38th Parallel. Soviet forces occupied the north side, and U.S. forces the south, each backing governments that reflected their conflicting ideologies. On June 25, 1950, two years after the Soviet and U.S. forces withdrew, 70,000 North Korean troops crossed the 38th Parallel to try to force a reunification under their government. That marked the start of the Korean War. Fighting intensified when the United Nations — led by the U.S. — on the south side, and then the People’s Republic of China on the north side, entered the war. A cease-fire was reached July 27, 1953. Five decades later; there have been signs of conciliation. Roh Moo-hyun, president of the Republic of Korea, or South Korea, and Kim Jong Il, leader of the Democratic People’s Republic of Korea, or North Korea, held a summit this fall, the second in recent years by the divided states. They signed a declaration calling for the establishment of a permanent peace on the peninsula, the resolution of the North Korean nuclear issue and improved economic ties. But for many North Korean expatriates living in Maryland and elsewhere in the U.S., the war never ended. The shooting was replaced by heavily armed borders and more than a half-century of longing for families left behind. It is a quiet battlefield with subtle casualties and deep scars of the heart. Reverend Wan Clan No remembers the date he last saw his wife and two children: Dec. 11, 1950. Six days after leaving home because he feared life as a Christian in North Korea, American fighters started bombing. 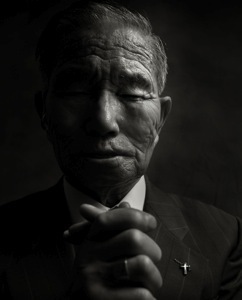 He, along with his wife and children, took refuge under a bridge as they sought to escape to South Korea, armed merely with rice his mother gave them, two pieces of clothing and a Bible. His wife told him that she was too scared to go on. His 5-year-old son was holding on to his mother’s skirt and wondering why his father was crying. She told him to come home soon, where she would be waiting. That was the last time he saw his wife or his then-5- year-old and 8-month-old sons. He says he prays every hour and cries every day, but says he has never given up hope of seeing the family he left behind in North Korea.